Canada has joined the club of states embroiled with irregular migration. But our challenges are not unique, and we have two decades of European misadventures with irregular migration to guide our response. Unfortunately, Canadian politicians are following a well-rehearsed script in which crisis responses to anti-refugee sentiment undermine liberal values, limit policy options and open us to blackmail by hostile neighbours. I have spent several years studying Europe’s relationship with irregular migration, most recently on a six-week trip that included looking at the Italian government’s hardline policies. Interior Minister Matteo Salvini came to power on a promise to expel 500,000 migrants, and has spent his short tenure repealing services, criminalizing migrant rescue NGOs, fostering xenophobic nationalism and undermining European solidarity. Salvini, also serving as deputy prime minister, blames migrants for longstanding Italian social problems like youth unemployment. In June, Tito Boeri, head of the Italian pension agency, clashed with Salvini on a very simple point that immigration was needed in light of an aging workforce. Salvini responded by stating that the tenured economist “lives on Mars” and that evidence-based arguments about demographics “ignored the will” of Italians. This kind of populism has troubling parallels in Canada. Ontario Premier Doug Ford has blamed asylum-seekers for longstanding affordable housing challenges and ended co-operation with the federal government on the issue. His stonewalling and scapegoating to foster a crisis in the lead-up to the 2019 federal election are well-worn tactics. Anti-immigrant populism trades on two interrelated trends. First, facts matter far less than voters’ feelings; second, as Daniel Stockemer from the University of Ottawa puts it, scapegoating migrants pays off at the ballot box. Ruling parties are caught in a bind since governments that want votes should be responsive to their citizens. But responding to anti-immigrant sentiments means policies with negative economic, social and security outcomes. Ruling parties in Europe have tried to thread the needle by getting tough on irregular migration while maintaining open asylum systems. They must show voters that they’re doing something when their political challengers claim they have lost control of borders and undermined public safety. Statements by Michelle Rempel, the Conservative Party of Canada’s immigration critic, about irregular migration are thus wholly unoriginal. Xenophobia fosters false opinions. Many Italians believe foreigners comprised 26 per cent of the population, when in reality it is only nine per cent. 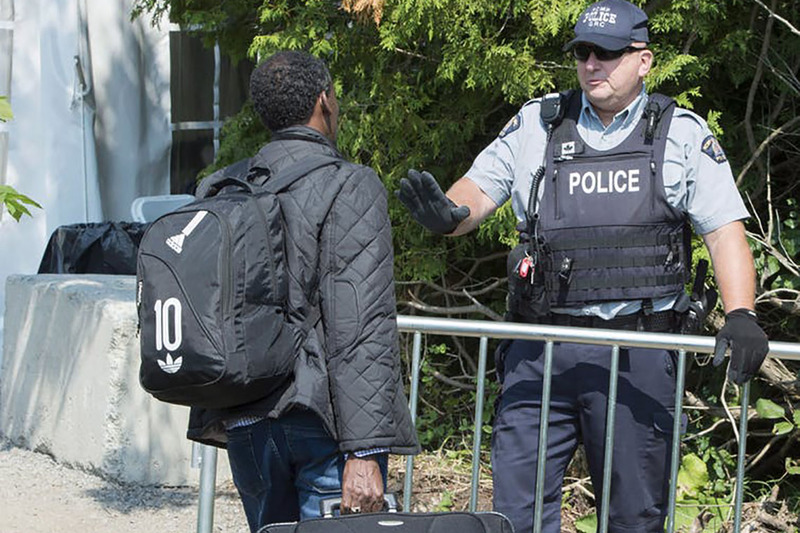 Similarly, a recent Angus Reid poll found Canadians overestimated the number of asylum-seekers by almost 60 per cent. The majority said Canada was too generous, and that the current situation represented a crisis despite the swath of Liberal ministers and range of credible experts saying the opposite. Crises demand extraordinary measures. Seventy-one per cent of respondents in the Angus Reid survey would devote resources to border security if they were in charge. Only 29 per cent said they would focus on assisting arrivals. Respondents were more aware of the asylum issue than any other in 2018. But as in Europe, Canadians’ strong opinions are based on feelings rather than facts. The federal Liberals have reacted by shuffling the cabinet and appointing a tough-on-crime ex-police chief to oversee the issue. But Bill Blair has been named minister of border security and organized crime reduction. While this might seem like a savvy move, bundling migration with security narrows the range of options to reactive and counter-productive policies that exclude economic and social interventions. When your only tool is a hammer, everything looks like a nail. Not to be outdone, the Conservatives would extend the Safe Third Country Agreement to the entirety of the border, meaning asylum-seekers could be turned back anywhere. Securitizing borders is expensive, rarely works for long and undermines refugee protection. It also results in more criminality. Prohibition in the face of high demand fosters black market supply. Illicit economies and more dangerous routes also make migrants vulnerable to human trafficking. What’s more, criminalizing migrants reduces policy options. Politicians in Europe are obsessed with “breaking” smuggling rings, with little interest in the supply/demand logics that drive them. Irregular migration becomes more spectacular, offering politicians fodder to escalate the response. This leads to right-wing parties framing migration as a civilizational threat, the starkest examples of which can be found in Austria, Hungary and Italy. Maxime Bernier’s tweets about “extreme multiculturalism” and the “cult of diversity” were cribbed from European populists. His break from the Conservative Party in favour of forming an intellectually and morally authentic right-wing party was right on script. Despite Conservative attempts to brush off Bernier’s defection at the party’s recent policy convention, a far-right fringe party could bleed voters. If Europe offers any lessons, the Conservatives will likely mimic Bernier’s arguments. That both Andrew Scheer and Michelle Rempel supported far-right activists to score points against Justin Trudeau is telling. So is the fact that Conservative delegates voted for ending birthright citizenship based on apocryphal stories of citizenship tourists. Canadians like to believe we are exceptionally tolerant. Environics pollster Michael Adams argues that Canada is particularly resistant to xenophobic populism, partly because of our immigration history. But the current situation reveals a different story: Canada’s openness is more about exceptional geography. In a 2017 study, Michael Donnelly from the University of Toronto found that Canada is no more tolerant than similar countries, and argued our resistance to populism is because we’ve been spared migration crises. That’s no longer true. What can be done? The government inherited a broken refugee system from Stephen Harper’s Conservatives, but the Liberals must address unsustainable backlogs in asylum processing, which cascade through the system and decrease people’s trust in its efficacy. Conservatives must ask whether scapegoating asylum-seekers for votes is worth the cost. It frays the social fabric, and will leave them holding the bag if they win the 2019 election. Political discourse matters. The migrants and asylum-seekers I interviewed this summer told me time and again that Salvini ascension had changed the mood. People routinely approach them in the street to tell them that their time is up and they’ll be expelled to Africa. Italian nationalists have shot migrants in the street. Recall that the Québec City mosque shooter was motivated by xenophobic nationalism. It can, and has, happened here. All of this might sound like the moralizing of a university researcher (from Toronto, no less), so I will conclude with a national security rationale. Canada’s 2019 federal election campaign will coincide with dates for ending Temporary Protected Status for hundreds of thousands of migrants in the United States. While some might choose to come here, the more troubling option is that Donald Trump could send them our way. Beggar-thy-neighbour policies can be used to exacerbate migration crises, and Trump is nothing if not a zero-sum thinker. As Kelly Greenhill from Tufts University has shown, states routinely use “engineered migration” to coerce or deter their rivals. Turkey did it to Europe in 2016, securing an extra three billion Euros with a threat that it would allow hundreds of thousands of asylum-seekers into Europe. It would take a profound willed ignorance to assume Trump is beyond engineering a migration event to deflect public opinion at home, influence the Canadian elections or leverage trade concessions. Politicians from across the spectrum have a duty to ensure Canada is not exposed to that kind of blackmail, particularly not for gains at the ballot box. That means de-escalating the rhetoric and co-operating to ensure we have our house in order. Craig Damian Smith is associate director of the Global Migration Lab at the University of Toronto's Munk School of Global Affairs & Public Policy.